Your representatives in the committee, boards, and commissions: Activities and events! Do you want to improve your vulgarization skills ? Do you want to share your doctoral expertise to the community ? If it is the case, the ADAS is happy to invite you for a workshop entitled : “Share your doctoral expertise through Wikipedia” ! identify Wikipedia pages where your contribution would be the most needed (linked to the topic of your thesis). Then, your contributions will be followed over a 1-month period by Frédéric Schutz with an expected personal work of ~10h. After the evaluation of your contributions, you will be able to validate 0.5 ECTS credits to the doctoral school. This workshop, sponsored by the Graduate Campus, will take place on Monday January 28 between 9h and 12h30 (coffee and croissants provided) in Amphimax room 412. Registration is mandatory and places are limited, so please respond back to our e-mail (adas@unil.ch) in order to subscribe to the event ! Twice a year, members of the ADAS organize a welcome session in collaboration with the doctoral school. The sessions are followed by an apero !!! Check the news to know the following dates …! D.DAY: Discover what your neighbors are working on! The grey days will soon be over, and the ADAS is preparing all kind of events for you! It’s already that time of the year, the D-Day is coming! Come numerous to present your work to your colleagues and see inspiring talks! 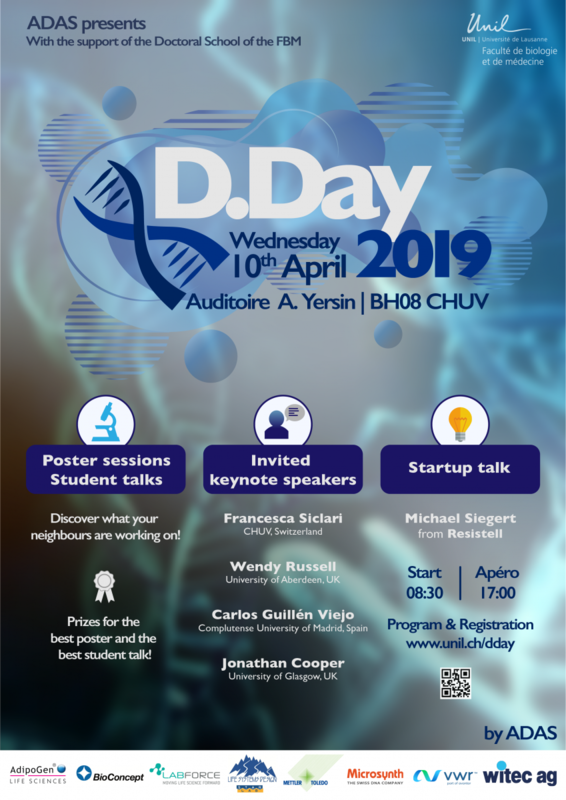 10th of April 2019 at the Auditoire A. Yersin in the main building of the CHUV! Check the D-Day page for more info. Every summer is punctuated by the annual BBQ of all the PhD students, assistants and post-docs. Share your doctoral expertise through Wikipedia !